Food supplement with microbiotic strains and rosemary and onion extracts. Lactibiane ALR consists of rosemary, which contributes to the normal functioning of the immune system, quercetin from onions, and a micribiotic strain, Lactobacillus salivarius LA 302, in the dose of 4 billion bacteria per capsule. 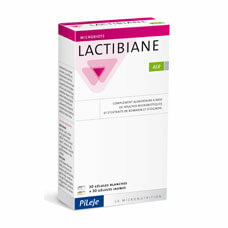 The microbiotic strain in Lactibiane ALR has been selected by PiLeJe under specific quality criteria. It is registered in the National Collection of Microorganism Cultures (CNCM). Not recommended for pregnant women and children under 6 years of age. Take 1 white capsule and 1 yellow capsule daily. Swallow the capsules with a glass of water, preferably before meals. Bulking agent: corn starch, capsule of plant origin, lactic ferments (carrier: corn starch), anticaking agents: glyceryl mono-, di- and tribehenate and colloidal silica. 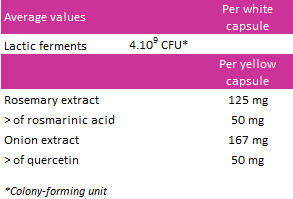 Allium cepa onion extract (bulbs), Rosmarinus officinalis rosemary extract (leaves), bulking agent: corn starch, capsule of plant origin, anticaking agents: magnesium stearate and colloidal silica.